« Run to get your tickets!!!!!!! 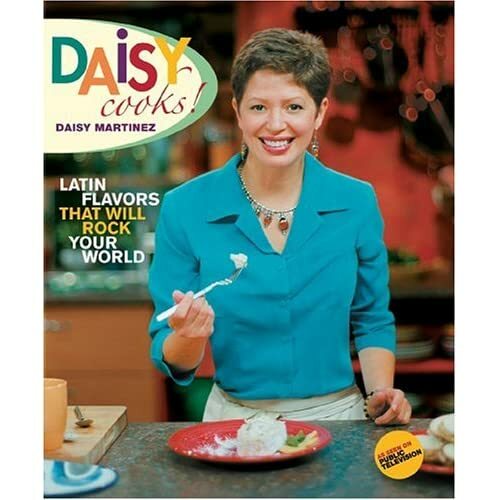 Daisy: Morning, Noon and Night!!! Whew!! What a month it’s been!! 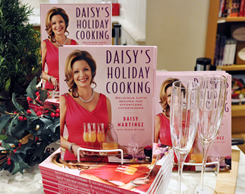 I was barely home from the South Beach Food and Wine Festival where my new book, Daisy: Morning, Noon, and Night, Bringing Your Family Together with Everyday Latin Dishes, was launched when it was time to leave New York City, for the start of my book tour – and what a tour it has been! The tour has taken us from the beautiful City by the Bay, where we did a live demo at the Ferry Terminal Market and were hosted to a phenomenal evening at Destino Restaurant, where the chef’s entire menu was from the book, and we even visited my friends, Spencer and Janelle at “The View From the Bay” on ABC! Everywhere we’ve gone, the book has been received with too many compliments to post, and I can say without pause, that I am thrilled to the gills! Imagine being able to share your joy and passion with people all over the United States and getting instant positive feedback! I am livin’ da dream, baby!! In the City of Angels Carolina and I were treated like royalty by the fine folks at Williams-Sonoma where I also did a demo and had a book signing. I met up with some old friends and managed to make a few new ones, as well. My Author Host, Rick Mangicaro was a really cool dude, who plays guitar for the Joe Walsh!! How awesome is that!!? We went to Dallas where we were treated with proper Texas hospitality at Chef Central where I taught a class-tasting and very warmly received, while everyone sang the books praises (thank you Lord! ), and while sometimes I felt a little overwhelmed by it all, I couldn’t help but wear a wide, wide smile for days and days! My tour brought me back home to New York for a minute, where taught a class at Don Coqui Restaurant in New Rochelle, the likes of which I have never taught before! Along with Chef Stephanie, the Executive Chef, I was behind the stove with 60 students, who were all eager to roll up their sleeves and participate in making the evening’s meal! The dinner At Don Coqui was truly a night to remember, with the wonderful blessing of meeting up with old friends and making many new (don’t you love that!? ), topped with delicious food, and much camaraderie. Many thanks to Jimmy Rodriguez and Chef Stephanie (or Chefanie, as I like to call her!) for opening their doors and being so incredibly generous. There has been SO much more – from our trip to Chicago, where we met up with some of our friends from the Maine Gang, to our signing at Borders in NYC where we ran into the rest of them! Chef Mark Mendez at the gorgeous Carnevale Restaurant made the restaurants “specials” from recipes from the book, while I signed books downstairs! In short, waaaaaay too many events to post in one newsletter, especially on the night before I leave for Puerto Rico for the SABOREA Festival, so I’ll have to blog them up over at Boriqua Blog, so make sure you drop by to stay tuned to all the revelry – and remember, North or South, East or West, it’s Daisy: Morning, Noon and Night!